This high-quality and easy to operate device gives you all you need for reliable light measurement. Implementing this practical instrument in your development and production environments can help you improve the light quality of your product and accelerate development. 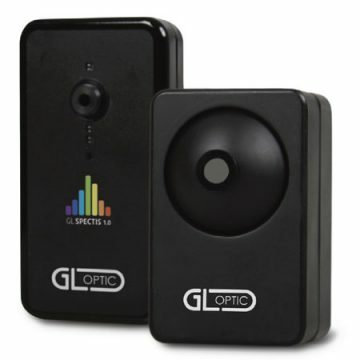 With its coded and interchangeable measurement head, the GL Spectis 1.0 can be combined with optical probes, integrating spheres or goniometers to measure any type of light sources, displays as well as LED lights. Thanks to its high sensitivity and accuracy, it is the perfect solution for light measurement. Don’t let the small size fool you. The Spectis 1.0 handheld spectroradiometer can measure any light source and provide the results you need. Evaluate products meet spec before you buy, develop better products faster, or ensure your products are manufactured properly. The Spectis 1.0 can be configured to do it all. Depending on your application you can use this handheld spectroradiometer as an illuminance / irradiance meter when you connect it to your PC, you can plug it to a small integrating sphere for single LEDs color and lumen measurements or combine it with a larger integrating sphere for the testing of luminous flux and efficacy of LEDs. Luminance testing is also possible with the use of dedicated GL Opti Probes. 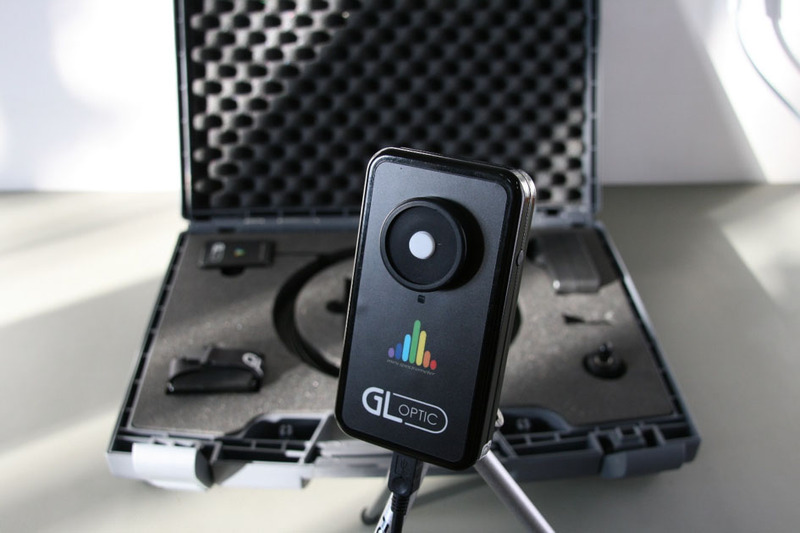 The GL Spectis 1.0 is a measuring device suitable for the final assessment of lamps as well as for testing of complete lighting installations. Combining high accuracy and low cost, it is an excellent instrument choice for common LED measurement applications. This handheld spectroradiometer is calibrated to provide absolute values of illuminance and color but also provides detailed Spectral Power Distribution and irradiance values [mW/m2]. 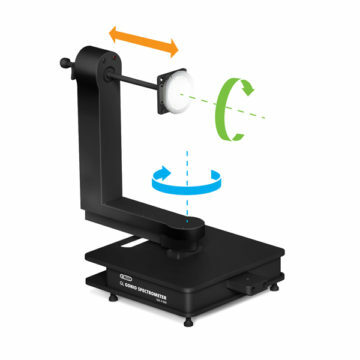 Use this on optical bench or tripod to create a measurement setup connected to PC. 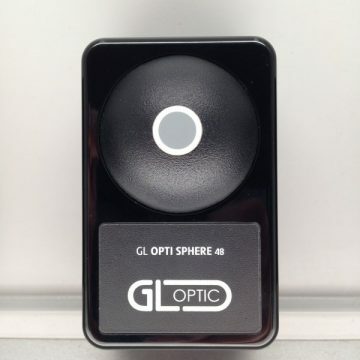 Connect this handheld spectroradiometer with our GL OPTI SPHERE 48 to measure flux (lumen) and color of single LEDs. This is ideal for incoming QC and evaluation of LEDs, drivers and other components during development. 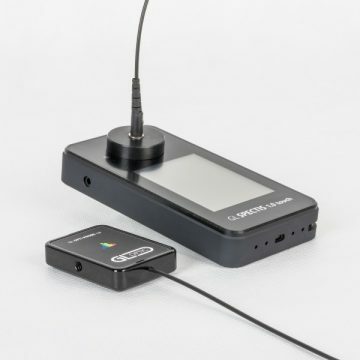 Available luminance optical probes can be connected and calibrated with this handheld spectroradiometer to measure flat emitting surfaces like displays, screens and back lights. The integrated coding system in all spectrometers automatically downloads the appropriate calibration file and measures cd/m2. Check available Opti Probes for Luminance and Illuminance. 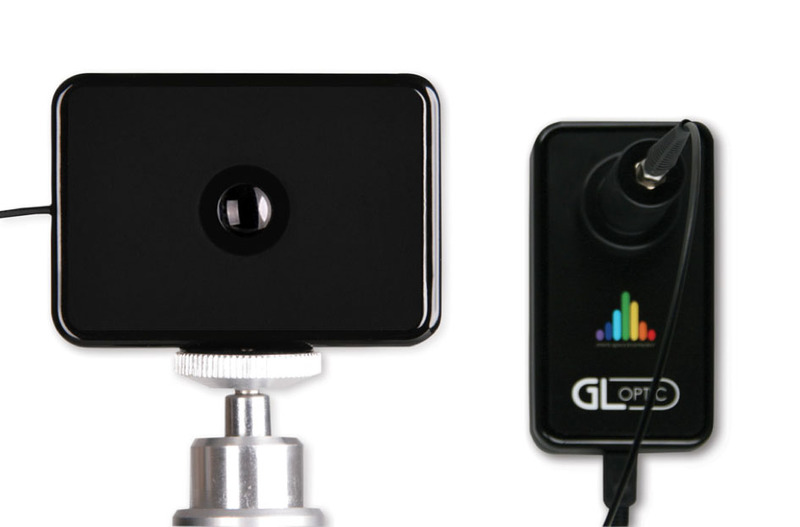 Pair this universal light measurement spectrometer with our small GLG 2-300 goniometer or the large GLG 20-1500 system for accurate LED lighting measurements and get photometric files and colorimetric data at once. 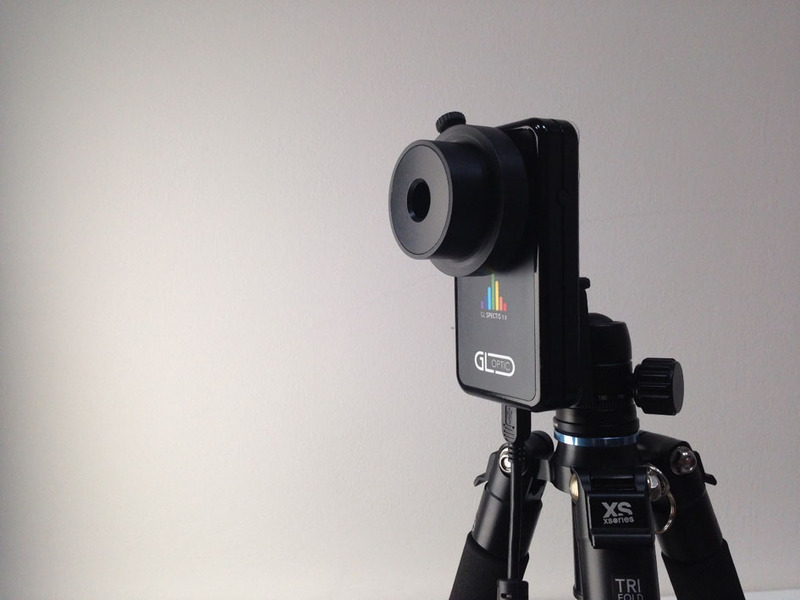 The Spectis 1.0 handheld spectroradiometer was developed to allow consultants outside the laboratory to verify the quality of light, but providing a portable, dependable and repeatable light measurement device. Our design focus was simple – to provide lighting professionals with a practical device they could trust. No need to send everything to the main laboratory for testing when you need to measure and decide onsite. This device is equipped with the Hamamatsu sensor to provide stability, low noise electronic to increase its dynamic range, temperature sensor to monitor and compensate for the dark current shift. We added the system of interchangeable accessories to support different types of measurements. Finally, it is equipped with a precisely designed measurement head to provide reliable lighting measurement. Initially used as a handheld device, despite its small size, it is a powerful instrument which becomes a part of many different light measurement systems we provide today. 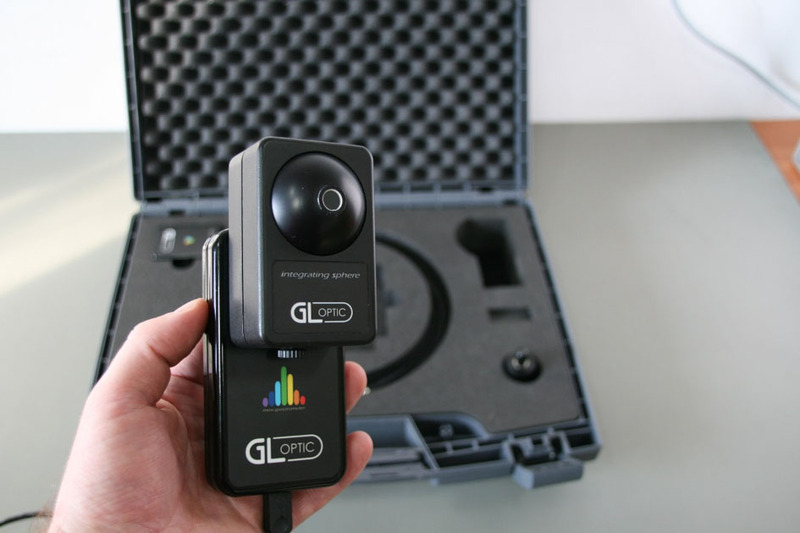 The GL Spectis 1.0 spectrometers optical system uses a miniature collimating lens with nano-imprint of diffraction lines and a CM OS image sensor working in the range of 340-780nm. It is a miniature low stray light system providing a 1.7nm data acquisition interval which is ideal for the measurement of LEDs, OLEDs and other light sources in the visual range. The electronic board ensures the proper speed of data transfer and very low noise. The temperature sensor installed on the board monitors the change of the ambient temperature and its influence on the measurement stability. The SP-X driver software includes any necessary correction procedures to reduce stray light, bandpass error, noise level and background level to achieve the best spectra representation and highest measurement accuracy. The data acquired are calculated according to CIE norms to obtain the right color calculation for LED and other light sources. Whatever your application, our precise SPECTIS 1.0 is up to the task. **Measurement below 5 lx may require customization to obtain noted specification. Please discuss with technical sales. Note: Instrument, firmware and software specification are subject to change without prior notice. All information included in GL OPTIC datasheets and product information available in any form are carefully prepared and included information believed to be true. Please note that discrepancies may occur due to text and/or other errors or changes in the available technology. We advise to contact GL Optic before the use of the product to obtain the latest product specification. Measure radiant power, luminous flux, color temperature, color coordinates and color rendering index (CRI) of LEDs. Optic probes for measuring illuminance and irradiance. The newest GL Gonio Spectrometer for DUT up to 300 mm.